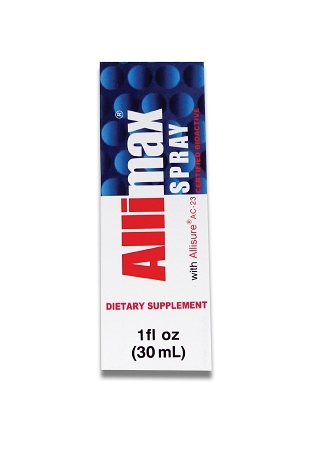 Allimax® Rescue Spray contains Allisure® AC-23 stabilized allicin and MINT oil and is made from fresh, raw garlic. I started using this product in place of antibiotics. It is truly Amazing. I can give it to my kids and they don't mind the taste because it has mint. I use it directly in the mouth, or sometimes mix it with water. I have used it for throat, teeth and gums before. I tell everyone about this spray. I have it on hand all the time, especially when I travel. What a great idea to have an allicin spray with mint! Love, love love…. Great product that I used - for canker sores,cold sores, sore throat, acne or boils... I sprayed this on the irritated area and also took the Allimax or Alliultra capsules and it went away very fast every time - with no side effects!!! Best Allicin products on the market today! Use the Rescue spray for sinus pressure. A couple of sprays up each nostril works almost immediately. Eye pain, pressure relieved. Like the spray better than drops although those work too. Felt the product was fresh . (.A burnt garlic smell clues me in the product is not fresh. Have had that happen before). Glad I found this supplier. I cannot use the product because it will not spray. I need a refund or the product that works.